Shanley’s appears to have been a solid mid-town restaurant, much above a diner and that sort but not a society or epicurean haunt. 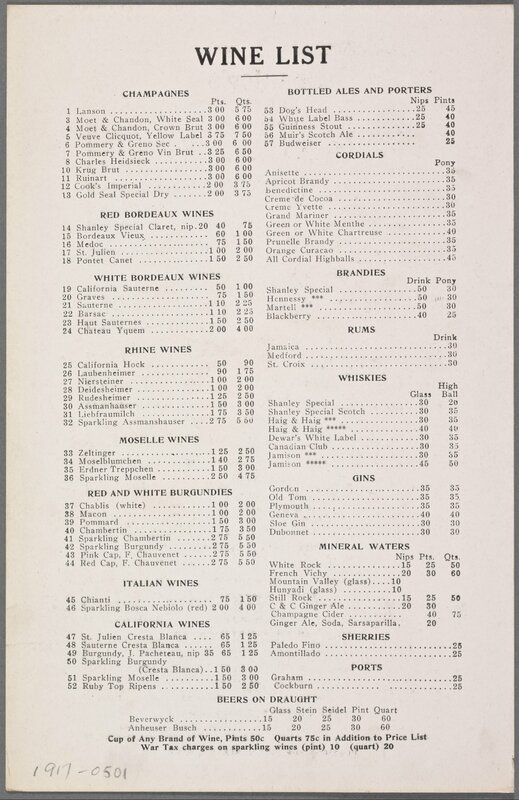 The food menu shows a range of dishes likely to appeal to the prosperous middle class of different ethnicities, including the old stock of New York, out for a show or other entertainment. In a compact page, a variety of drinks groups is covered. Notable attention is given to “California wines”. As far as I know, this is one of the first menus to feature such wines under that description and not part of a general “American” category which could include, for example, New York State sparkling wines and the native-grape Catawba type. Indeed many earlier menus simply avoided American wines; this started to change about this period, and gained in speed from the 1950’s on after the interruptions of Prohibition. While still described by reference to European original types (Moselle, Burgundy, St-Julien (Bordeaux), etc. ), these California productions clearly found favour with people, as they did on Rector’s higher-end menus of about the same period. Americans were starting to take pride in their own. Cresta Blanca produced numerous of the wines featured by Shanley’s. This property still exists and is now owned by the well-known Wente house, it is used as a special event locale and I believe grapes are still grown on the property. On the beer side, one sees the usual suspects as bottled imports and Budweiser offered as a premium domestic beer. Another beer from Anheuser-Busch is available as a draft beer, probably the same brand. Budweiser then was probably a very good beer and perhaps tasted more like a modern Czech lager than the present Bud – but who knows. A Beverwyck beer was the other draft selection. Beverwyck was an old house from the State capital, Albany, up the Hudson. Likely it was an ale. Beverwyck lasted into the early 1970’s but had been purchased by Schaefer in the 50’s, whence the bell started to toll. Fetching its ale from upriver showed that Shanley was intent on presenting something different from the beers of Manhattan, boroughs and Jersey, but still “Empire State”. Shanley’s looked like a fun place, probably offering excellent quality without pretension, qualities valued no less today – when you can find them. 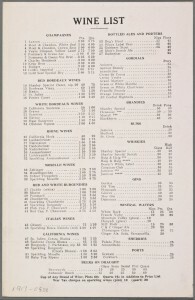 *The full menu is at http://menus.nypl.org/menus/32763 and is from the New York Public Library’s (www.nypl.org) archive collection of historic menus. 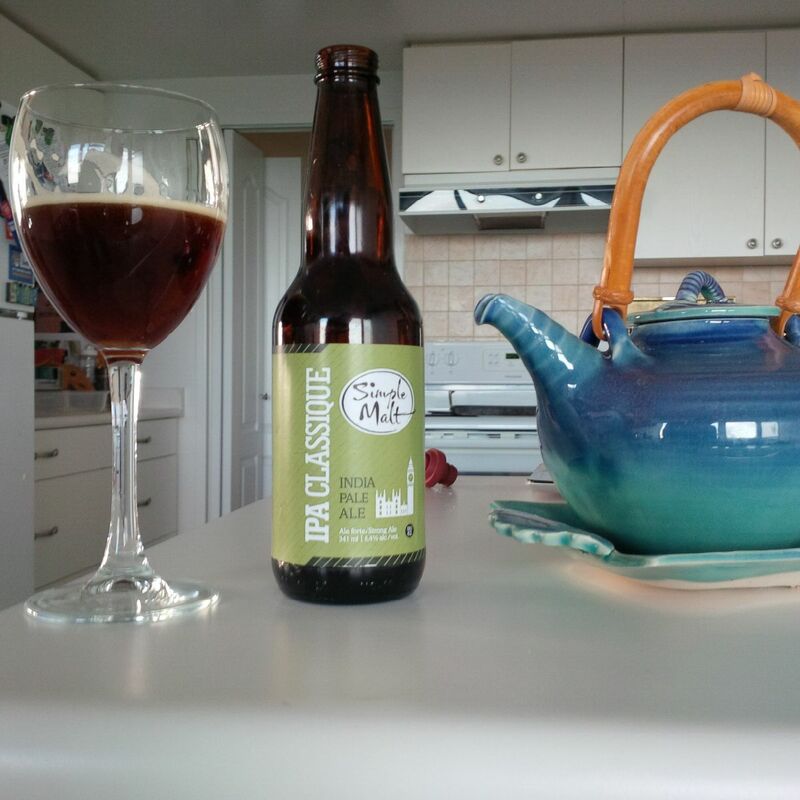 This brewery in Saint-Eustache, QC essays a “classic” style IPA, ce qui veut dire that a darker colour is wanted than for current (American) IPA, and presumably a hop taste different from the typically grapefruit salad palate of Stateside IPA. The colour is close to modern English pale ales but a little darker I think than most of those. The malt taste is sweet and shows the likely addition of crystal malt, again following modern English practice. Ironically, the all-pale malt American IPA is likely closer in colour and perhaps malt taste to many 19th century – or truly classic – English pale ales/IPAs, but let’s set that aside. The hop taste is complex, showing the mix of five hops advertised on the label. The types are not indicated, but I’d eat my hat if one of them isn’t Saphir. Withal one has a taste of dark sweet tea, rosewater and dank green herbs. I’m good with it, whether classic in style or not. This is another room temperature tasting, and while I’m jiggy with that too, I can see this beer going great well-chilled with a cold weather tourtière or similar hearty old dish. Santé! Regarding my post of yesterday, I am not suggesting the term “lager” was not used by American brewers and brewing writers from, say, 1875-1975 to describe bottom-fermented beer produced at cold temperatures: of course it was. Similarly, the brewing industry always knew the sub-distinction between mild ale – ale not stored, meant for immediate consumption – and beers proper such as porter, stout and pale ale, stored for a time and with a higher hop rate than mild ale. However, based on my reading, the American brewing industry often used the term beer to mean specifically lager. That is, for day-to-day purposes including production, sales and marketing, “beer” was lager – usually a blonde lager in the light American style, but not ale or porter/stout. One sees evidence in numerous references in A.L. 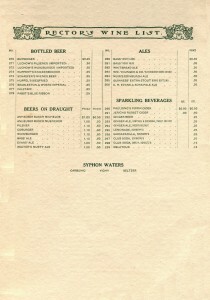 Nugey’s mid-1930’s brewing manual, for example. I’d have to think Nugey was repeating something familiar to the pre-Prohibition brewhouse given the halt in production from 1919-1933. And this usage was paralleled in the market at large which included finally some restaurant menus as we saw in the early Rector’s example. Did the usage begin in the market and filter back to the brewhouse and distribution channels? Entirely possible. It is interesting that Rector’s did not include the term lager in its listing of bottled and draft lager beers – “bottled lager” would have been a more correct heading to use to contrast with the bottled ales, but this wasn’t done. I believe as well that most beer labels at the time, i.e., later 1800’s until about Prohibition, didn’t use the term lager. 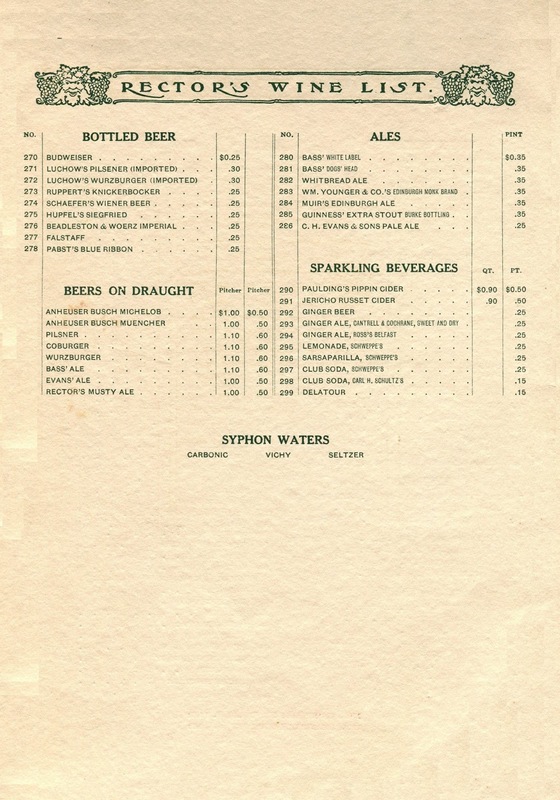 In the colour plate section entitled “Pre-Prohibition Breweriana Advertising” contained in Michael Weiner’s The Taster’s Guide To Beer (1977), one sees e.g., Miller High Life Beer, Seipp’s Extra Pale Beer, Providence Brewing Co.’s Bohemian Beer, National Lager Beer, Moerschel’s Sedalia Beer, Wiener Blatz, Falk’s Export Beer, Feigenspan Bock Beer, Busch Beer, and so on. As always, there is the exception: H. Clausen on its label advertised Export Lager Beer. The West End Brewing Company in Utica, NY, still going strong under a different name, advertised its Pilsener and Wuerzburger brands on a beer tray. That is not the same thing as using the term lager – beer was often described, indeed internationally, by reference to a town or area of origin. In about forty-five ads in Weiner’s book “lager” was only used on a couple of labels. Not a scientific sample, but still. Only much later did lager, as a term to describe the main American beer type, enter the general market and in advertising. In a word, it had lost its foreign connotation and strangeness by then. It may be noted that this uniquely American usage of “beer” was the obverse in the same period of British usage: there beer meant porter/stout, pale ale/bitter and (finally) the mild ale which in the 1800’s had been considered apart. Lager was the term used to describe the Continental blond beer, served cold and fizzy, which was a relative newcomer to the British scene until finally there too all forms of malt beverage could be called, or by most, beer. Once again I don’t for a minute say that some people in the Anglo-Saxon world weren’t always pleased to call any form of malt-based alcoholic beverage beer, of course they were, but it is also true that for a long time in common and trade parlance, the term beer meant something more specific. The fragmented attention of our age, which has only gained tremendous pace with the growth (paradoxically) of the global village, can deceive as to origins and trends. The beer renaissance started in the late 1970’s and one of its hallmarks is “cask” beer: beer served from a barrel in which a slow secondary fermentation continues and dispensed without additional pressure, direct from a thumb-tap or more typically by a hand-pump system (similar to the one still seen in the country which operates with a piston and vacuum system). 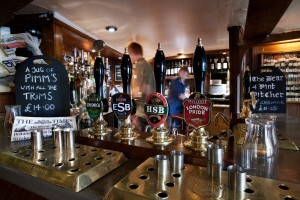 Beer dispensed in this way was called real ale when coined by CAMRA enthusiasts in the U.K. in the early 1970’s. The term now has a period flavour and is rarely uttered except by the historically minded or superannuated. Despite the beer revival mentioned, cask ale was slow to take root here, unlike in England where it still has an honoured place in the market albeit reduced from its pre-1970 heyday. The reasons are many: it is difficult to handle and can easily turn sour or become infected; also, it dispenses at less than a chilled temperature, which puts off a lot of people; finally, due (IMO) to a misapprehension here that such unfiltered beer should look cloudy in the glass, the pints often poured rather turbid. Many people don’t like this, for aesthetic or taste reasons. Nonetheless as craft brewing has grown, cask has grown too, and most beer bars of any repute now offer a cask beer or a few of them, at least periodically. While many beer fans know that cask beer hails from and has been long-honoured in the United Kingdom, and that analogues exist elsewhere in Europe which have been followed here, such as Keller Bier and variations (some entail added pressure, some don’t), few understand that top-fermented beers were commonly dispensed in this way in North America. This was at an earlier stage of our brewing history, from the 1800’s until at its latest the 1930’s. A frequenter of the famed McSorley’s in New York, if he peers carefully through the people and the dust, will perceive a disused set of hand pumps on the backbar. They are arrayed in a curved housing similar to what you see in this image from Billie’s Bar of New York City from the mid-1930’s. The 30’s hand pumps at Billie were still in use as one can tell from the pitchers beneath them. (Now did those pitchers contain ice water, intended to be placed on tables as customers walked in? This is possible but I don’t think so. Stock, India Pale, Burton and other ales, as well as brown stout and porter, were still being made by some breweries in the New York and Jersey area then; this form of dispense was a natural for such beers. Even if they were water-pumps by then, their existence attests to their original function at an earlier date, pre-Prohibition that is). If McSorley’s and Billie’s had beer hand pumps, other places had to have them too. It was probably a small handful, but this type of beer service, inherited from English influence in the earlier 1800’s, hung on for a quite a time in America. It’s not new here, and likely the same applies for Canada: the craft beer revival simply brought back an old practice. As in our day, those pumps probably sometimes spouted clear beer, hazy and yeasty/sludgy. Whether it tasted similar to our countless varieties of “cask” is hard to say though. A diamond of an old menu appears here from the classic German-American restaurant, Janssen Hofbrau Haus. * Operated in New York from 1898 until the 1960s it was founded by August Janssen, a real estate mogul and restaurateur (1867-1939). The house slogan was “Janssen Wants To See You!”, no doubt a double-entendre for his many employees. New York once had a tradition of German eating, from the substantial influx of German-speakers that began in the mid-1800s. Famously they concentrated in the Yorkville area on the Upper East Side. A classic product of German Yorkville was Lou Gehrig, for example. Donald Trump’s paternal line descends from New York-based German incomers in the 1800s. For that matter, Jacob Astor was a German immigrant mogul, albeit of an earlier generation. A significant sub-set of this German crowd was Jews, the upper crust portion memorably portrayed by Stephen Birmingham in an absorbing social history, Our Crowd. The menu of Janssen’s Hofbrau covered many bases in German and American eating but primarily rendered the metropolitan and hotel cuisine of contemporary Germany and Austro-Hungary. Whether hot dishes or cold, fish-based or game, eggs, delicatessen, grills, there was an enormous choice. Only the famed Luchow of New York had a comparable range. With the onset of WW I the Hofbrau Haus remained open despite the sentiment that ran high against German-Americans following the Belgian invasion and the Lusitania disaster. Overt displays of the German ethos were held to a minimum in New York to avoid the charge of siding with”Kaiser Bill”, but Hofbrau Haus never closed. A high-end, international reputation helped it survive the period of anti-German sentiment. The same thing occurred during the next war. By then the restaurant had relocated to Lexington and 44th street in the still-standing Greybar Building. (Perhaps Hofbrau Haus had some connection to the famed German beer hall of the name although I’ve not been able to substantiate one). Even in 2015 New York hasn’t quite forgotten its German history. There are German restaurants and pubs scattered in Manhattan. One or two are still in Yorkville and also Staten Island, Queens, and New Jersey. A Goethe Institute continues its good work in Manhattan albeit, at Irving Place, far south of Yorkville. The original Munich Hofbrauhaus now has a small outpost mid-town, as does Paulaner which brews onsite in the Bowery. Still, it is a safe bet that no German restaurant in New York today, and probably few outside Germany anywhere, can equal the breadth of Janssen’s menu. The menu is decorated with an ornate Germanic design and portrays scenes from the equally Teutonic decor of Janssen Hofbrau Haus. The restaurant’s artistic and cultural goals are well expressed in Baroque narrative in the handsome and ornate menu. The authenticity extended to the small but well-curated and explicated beer list, set out on page 9. The best saved for last, we might say. There were four beers described by name, all imports from Germanic territories, all draft, and amazingly, each from a brewery still in operation. As the menu explains, the restaurant took significant pains to ensure a quality “seidel”, noting that 36 barrels were kept in constant operation with temperature carefully controlled. How beer was shipped then from Central Europe to America is not something easily fathomed but I’d guess the trip took a lot longer than now. These draft beers surely were not pasteurized, so how they arrived in a drinkable, let alone ideal, state is hard to understand. The boss beer bar of pre-WW I may have arranged a way still to ensure a top glass every time. Its critical clientele would have expected no less. In any case, the beer list clearly was of repute. Domestic beers were available too at Hofbrau Haus but not dignified by name – presumably these local productions were not felt worthy to bracket with great Central European originals. One wonders if cultural pride and the lure of the import made people drink long-travelled beer that was actually inferior to the best New York brewing kettles. We will never know, but in a good-size city one can do the test today and decide for oneself. Each of the four beers was accompanied by a taste note which, if one ignores the puffery on health and doctors’ opinions, wouldn’t be out of place on BeerAdvocate or a current beer blog. Light, bitter, slightly veiled. This is the lightest [meaning in colour] of all beers and contains the smallest amount of alcohol [4.4% ABV then and now, not so shabby actually]. Münchner Hofbrau [this is the modern Dunkel, or dark lager of Hofbrauhaus in Munich]. Dark, sweet, creamy. The finest brew in the world. The burgundy of all beers; very dark, creamy and full of character. A little lighter in the color than the Munchner,not quite so sweet, and therefore a good medium between Pilsner and Munchner. It’s easy to check reviews of these beers on a modern rating service. For the last two breweries, beers differently named correspond closely to colour and taste on the Janssen’s menu. Pilsner Urquell is not “veiled” (lightly cloudy) as available anywhere today unless you get a Keller version in the Pilsen cellars, so the beer sent to New York in the early 1900s sounds pretty authentic. Let’s raise a New York cheer – not a Bronx cheer, a real one – for what was an important beer and dining haunt in the Gilded Age and long after. And it’s more proof that great beer was always taken seriously by some people in some places – it was always part of gastronomy, a conclusion reinforced for us recently with the success of our Waldorf Hotel 1944 Beer Tasting Recreation held recently at Dora Keogh Irish Pub in Toronto. *Note added August 21, 2015: Please see the comments below of noted ephemera and menu-collector Henry Voigt who states that the menu in fact dates from 1934, despite bearing a copyright notice of 1908. On page 7 of the menu we read, “Ten years ago…the doors of the Hofbrau Haus were first opened to the public”. As it opened in 1898, this, plus the curator’s notice Henry Voigt mentioned, convinced me initially this menu is a 1908 original. In fact this appears not the case. Many thanks to Henry Voigt for his expertise. Still, one way or another, these fine beers were long available at Janssen’s, probably from close to inception of the restaurant and until the 1930s at least. English drinks and food writer Henry Jeffreys has sagely observed that a resolute focus on a top scorer or style is not the only route to finding a gem, that serendipity plays a role if only given the scope, with the pleasure being commensurate. This truth was brought home to me recently when I found an Engineer’s IPA more than half-full, closed with a whiskey cork, behind a group of whiskeys in a drinks cupboard. I had put it there a couple of months before and had completely forgotten. I had consumed part of the bottle, closed it and placed it in an available spot behind a forest of whiskeys, well a grove anyway. Sometimes I keep bottles in this form for a short time to drink later or use in blending experiments, of which I am a proponent. (It is surprising how blending can cause consternation among even the cognoscenti let alone the non-advised: once after nonchalantly tipping two malts together at a LCBO tasting counter a lady at the other end said, “how interesting, but is that legal?”. I explained that if Scots grocers could do it in the 19th century and thus inadvertently create blended Scotch, one of the most famous drinks in the world for the next 100 years, I could do the same. Somehow she didn’t seem convinced, but thanked me nicely). And so I fished out this dusty item, and took the cork out, at which there was a loud report. One of the stories of how bottled beer started in England is, a fisherman put some ale in a bottle, went to a stream with his rod, and when he came back realized he had left the bottle on the bank, partly consumed. (Was it Isaak Walton? I need to check this). Some time later he fetched rod and reel and returned to brave his luck on the lazy English river or branch. Lo, he finds the abandoned bottle, still partly full and closed with a rag or something else in the neck, and extracts the closure. He recorded that the bottle had become a “gun”, referring to the build-up of CO2 from the beer working away at a warmish temperature and the cloud of vapour which burst from the neck when the bottle was opened. And he found the beer excellent. Well that’s exactly what happened to me, the bang was loud just like the angler said, with a puff of steam coming out as from a gun. Despite all the pressure in the bottle, the beer wasn’t that fizzy and was well-rounded, in a word, matured. In the past, I’ve found that opened bottles kept for a time unrefrigerated will often go south but this beer was just fine, better once again than the first sally. I was attracted to this “Farm Table” offering from the innovative and ambitious Beau’s Brewing Co. due to the fact frankly that the beer is not an obscure or laboured style as it were (beers dosed with coffee, cocoa, hot peppers, ginger, Thai spice or other things I find generally don’t add much and often take away from what beer should be). 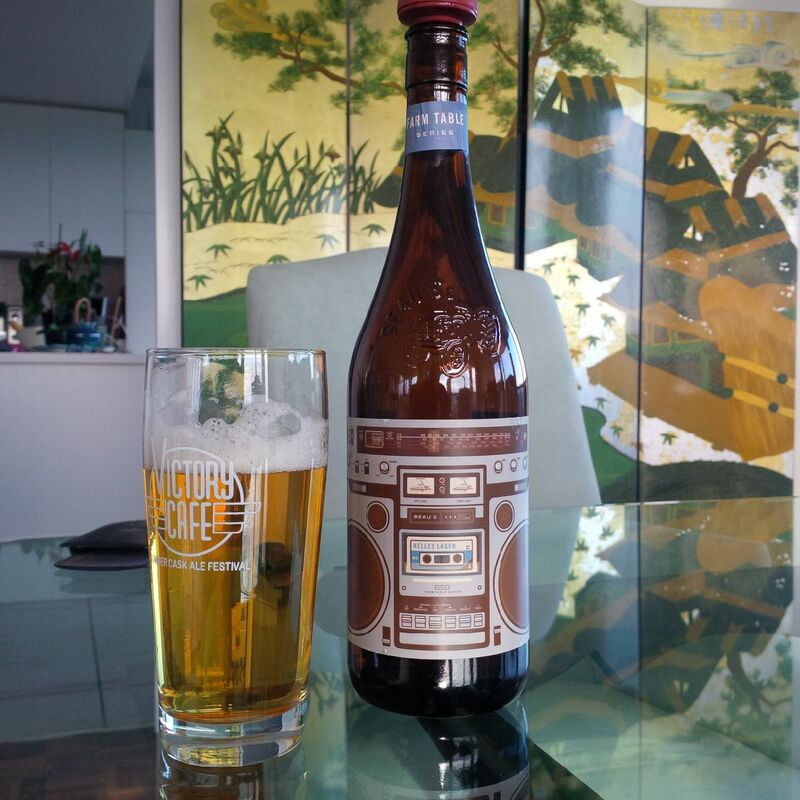 This is labeled as “helles lager”, a classic Bavarian type of beer of which numerous brands are available as imports at LCBO. I was much impressed with the fidelity of the beer – it tastes very similar to Jever, Warsteiner, Konigsberg and other German blonde lagers. It is dry for a helles but the style has become so in Germany too in recent decades (it used to be sweeter and richer). The beer has the classic oniony yeasty note, a lager fermentation flavour that many helles and pils beers have. It tastes exactly like many beers I had on my trip to Munich a few years ago, and similar to numerous canned imports of this style when fresh. 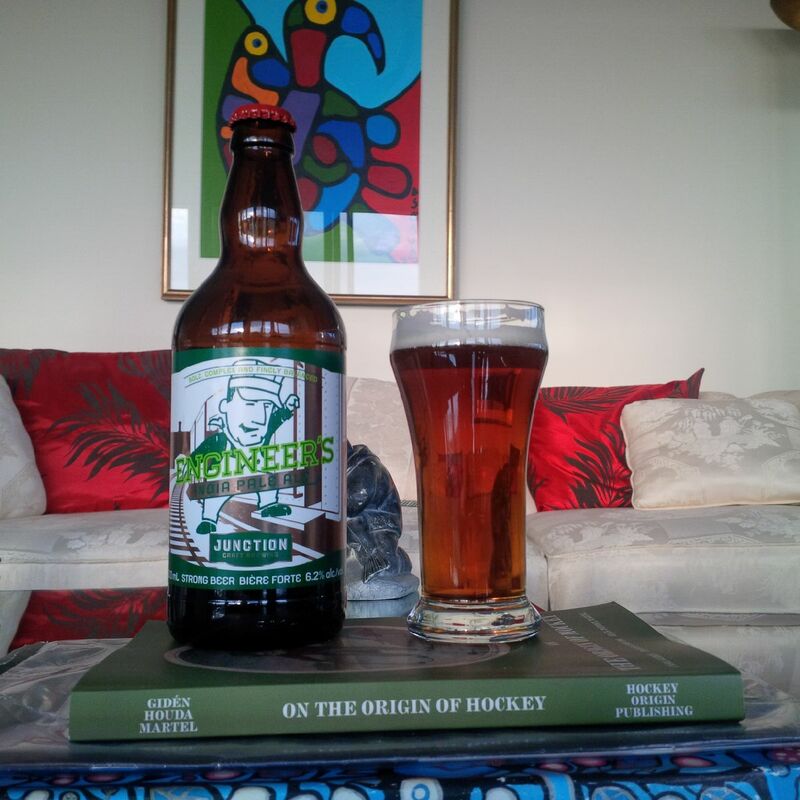 I won’t say it’s my favourite style but I enjoyed the bottle for the exact mirror Beau has offered of what good beer often is like in the homeland of the style. Now Beau, can you do an exact clone of a great English bitter, say with two-row floor-malted English malt, no or just a little sugar and lotsa Kent hops? I’m there. John Holl (@John_Holl) has alerted to an excellent article just up at All About Beer by Tom Acitelli, here. 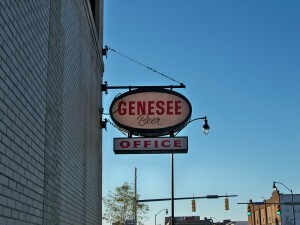 Tom explores the history of Genesee Cream Ale, an iconic brand of the old Rochester concern. It’s a good beer especially on draft, and more importantly to some, it recalls a certain time. I’d hope the same malt percentage and hop spec are used as per original formulation. I wonder what Gary Geminn would say of Genesee 12 Horse Ale, particularly its original formulation. By the time I came upon it in the 80’s, it was hardly more flavourful than the Cream Ale. At inception, I’d have to think it was a much better beer. Off South Winton Drive in Rochester aka the Flour City, the pioneering retailer Beers of the World had its main store for many years – now relocated elsewhere. Because I went there a number of times, I learned about Fox’s Deli next door, an excellent New York-style deli with its own take on things as all good delis should have. It offered Genny Cream on draft in stemmed schooners and it always tasted best to me there. I looked at the current menu and am glad to see Genesee beers are still mentioned, the bottled form specifically. One hopes mavens of the draft cream ale will be rewarded by a quick scribble on the pad followed by a frosty schooner as I remember. A Reuben at Fox’s, schooner of Genny draft, and a Kent with the Micronite filter after. (Oops, let’s lose the Kent). I hope one day I can meet Tom and John for lunch at Fox’s – give me some dates, gents, and I’ll brave the border. As I write it’s over 8o F in the room and I’ve just opened a l’Interdite from Brasseurs du Monde in Saint-Hyacinthe, QC (brasseursdumonde.ca). It’s taken straight from a 12-pack – tablette – of three of their beers. The first one, the Assoiffée, a Belgian-style dubbel, was as much a winner as this one. The beers are bottle-conditioned, which means they retain their original yeast or enough to ensure a slow conditioning. Despite some weeks at ambient temperature and being knocked around before that on the trip from Montreal, they are fresh-tasting and as good as can be. The yeast in the bottle uses up the residual oxygen, preserving high quality despite daunting storage conditions. Had brewers stuck with bottle-conditioning vs. the ubiquitous heat-pasteurization, overall beer quality would be superior in my opinion, but that’s an issue for another day. The Interdite is a 6.5% IPA and claims an American style, which it is, as it has the American citrus punch (thank you Oregon) notably in the aftertaste. However, there is a grateful English influence as well, both in the Ovaltine-and-quinine flavour but also the darkish colour. 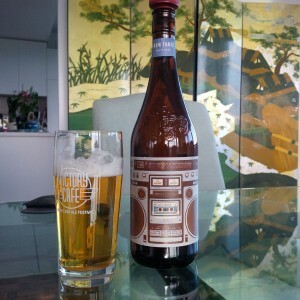 It reminds me quite a bit of the legendary Ballantine IPA in its heyday. How can you drink IPA, or any beer, room temperature in this soaking heat? Mais c’est bien simple. “When you’re a Jet you’re a….”, okay? I’m not saying I would turn down the beer in chilled form but it’s best this way to scope all the subtleties. You wouldn’t chill a red wine – or very much – same thing for a beer of this quality. I’ve placed next to it a book I was re-reading recently, one that had a big influence on me, Stephen Morris’ The Great Beer Trek (1984). 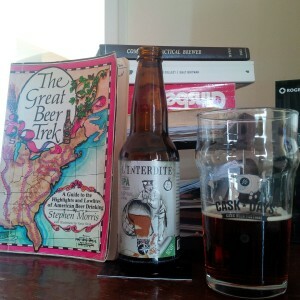 I’ll write a separate post on this book but suffice to say it’s one of the top 5 beer books I’ve read. Morris and his wife took a beer tour of America in 1978, so essentially at the dawn of the beer renaissance but it was early enough that he covers the first craft brews to emerge, e.g. Sierra Nevada and New Albion. Essentially though it is a lively canvas of the light North American lager style as produced by the national and surviving regional breweries of the day. Morris, a Vermonter with the idiosyncratic perspective of many from that state, is still going strong and I had an e-mail palaver with him a couple of years ago. The book’s engaging hand-drawn artwork is another plus, including drawings of Dogbone Brewing Company and its “tap”, McDogbone Ale House, Morris’s projected ideal small brewery. It is one of my regrets that a planned Dogbone brand, Bolt Upright, never saw a bar-top. Morris had come out of the home brewing culture of upstate hippie Vermont and … well… more anon about this fine book. The brown volume in the image is Complete Practical Brewer, a mid-1800’s tome that is a constant reference. The red volume is a biography of the poet Allen Ginsberg – I went through a beat phase about 20 years ago (the literary aspects not the political such as it was) and was reading about him again. You don’t really hear much about him now, all things must pass, as George Harrison, from a band rather better remembered, wrote. But there was a connection after all, think of the Beatles’ name. The white volume is Walt Whitman’s Specimen Days And Collect. Whitman was a forerunner of the Beats and much more of course. A very interesting writer, the parts about the Civil War are very moving, someone should do a film of Whitman’s time spent in hospitals in Washington, D.C. during the war. It all ties in and it all makes sense at beeretseq central.